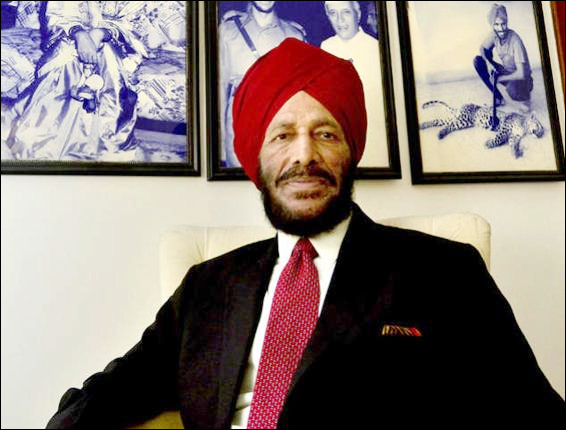 Milkha Singh is also known as The Flying Sikh was born on 20th november 1929, is an Indian former track and field sprinter who was introduced to the sport while serving in the Indian Army. He was the first Indian male athlete to win an individual athletics gold medal at a Commonwealth Games. Milkha Singh is highly respected for his sporting achievements. Milkha Singh was born into a Sikh Rathore Rajput family in Punjab, in undivided India during the pre-independence days. He was one of 15 siblings, many of whom died during childhood. Milkha was very heart broken and frustrate after losing so many members of his family and he considered becoming a dacoit. However, one of his brothers advised him to join the army instead. Milkha Singh tried to join the Indian army thrice but was rejected every time. Finally he got selected in his fourth attempt in Indian army. In 1951, Milkha was stationed at the Electrical Mechanical Engineering(EME) Centre in Secunderabad and that’s when he was introduced to athletics.As a young boy living in a rural place, Milkha had the habit of running the 10 km distance to reach his school. His early habit of running helped him finish sixth in a compulsory cross-country run for new recruits. He was selected by the army for special training in athletics. Realizing that he had potential, he started training five hours daily, often running in difficult terrains like the hills, the sands on the bank of rivers, and against a meter gauge train. His training was sometimes so intense that he would be sick with fatigue. Milkha Singh was chosen to represent India in the 200m and 400m races in the 1956 Melbourne Olympic Games. At that time he was so raw that he could not progress beyond the initial stage. However his introduced with the 400m champion at the event, Charles Jenkins, gave him knowledge about proper training methods, and thus inspired him to do better next time. Milkha Singh participated in the National Games of India in Cuttack in 1958 where he set national records for the 200m and 400m. The same year he won a gold medal in the competition of 400m race at the Commonwealth Games in Cardiff, making him the first male Indian to have won an individual athletics gold medal at those Games. Milkha won the gold medal at the 1958 Asian Games in Tokyo beating the Pakistani runner Abdul Khaliq. This prompted an invitation from Pakistan in 1960 for another race. Initially Milkha decided not to go as the burning memories of the partition were still fresh in his mind. But Jawaharlal Nehru convinced Milkha to get over his past and go to Pakistan. His race against Abdul Khaliq was a much anticipated one—over 7,000 people had gathered in the stadium to watch the race. Milkha once again beat Khaliq in a nail-biting finish. Impressed by the Indian athlete`s performance, the then President of Pakistan, General Ayub Khan, who had also witnessed the historic race complimented him by saying that he did not run, but flew. Thus Milkha gained the famous title `The Flying Sikh`. Milkha participated in the 1960 Olympic Games in which he was one of the favorites. He finished fourth in the 400m final which was eventually won by the American Otis Davis. Losing at the Olympic is something that haunts the great athlete even today.During his later career he became the Director of Sports in the Punjab Ministry of Education, a post from which he retired by 1998. Milkha Singh met Nirmal kaur, the captain of the Indian women`s volleyball team in 1955 and married her in 1962. The couple has three daughters and one son. His son Jeev Milkha Singh is a famous golfer. In 1999, the couple adopted the seven year old son of a soldier who died in the Battle of Tiger Hill. Milkha Singh has donated all his medals to the nation which were first displayed at the Jawaharlal Nehru Stadium in New Delhi before being moved to a sports museum in Patiala. He founded the Milkha Singh Charitable Trust in 2003 with the aim of helping needy sportspersons. 1. As a young boy Milkha Singh used to walk a distance of 10 km barefoot from his home to a village school in Pakistan. 2. Several members of his family including his father were killed during the partition of India. His father`s last words as he lay dying were `Bhaag, Milkha` (run for your life Milkha). 3. This legendary runner was eliminated in the first round of 1956 Olympics in Melbourne, Australia. 4. While in the army, he often trained himself by racing against the meter gauge trains. 5. He sometimes trained himself so hard that he used to spit blood, urinate blood and even fall unconscious during his practice sessions. 6. At the 1958 Cardiff Commonwealth Games, Milkha became the first individual to win a gold medal at the Commonwealth Games from Independent India. 7. His success in the 1958 Asian Games led to his promotion from a Sepoy to Junior Commissioned Officer in the army. 8. Milkha Singh became a source of wonder at the 1960 Rome Olympics as the Romans had never before seen any athlete sporting such a unique headgear and long beard! 9. He accepted only Re. 1 from film producer Rakeysh Omprakash Mehra to allow him to make his biopic `Bhaag Milkha Bhaag`. 10.He refused to accept the prestigious Arjuna Award in 2001 saying it came `40 years too late`.